Our well trained, service-oriented personnel will work with you every step of the way. We will quickly and effectively clean your ceilings or walls with little or no business interruption to your facility, employees, or work schedule. We can schedule our crews around your down times including after hours, weekends or whatever meets your needs. Ceilings, structural support, walls, pipes, ductwork and other overhead structures must be cleaned regularly to prevent them from becoming a source of contamination to a facilities personnel, production equipment, and products. Unfortunately, regular cleaning of these surfaces is overlooked until a problem arises. The frequency of service depends on the facilities needs and the surfaces involved. Different areas have different needs, and those needs change depending on activities taking place inside the building or nearby. Ideally the cleaning should take place when the area is vacant. As this is not always possible, Champion can work around your production schedules to minimize the disruption to the facility. Have a look at the ceiling in your facility, and then let the experienced staff at Champion help you clean up your act. 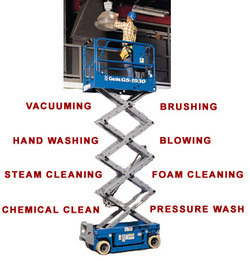 You'll find our staff competent and fully experienced in the use of scissor lifts, boom lifts and other specialized equipment needed to carry out the work. Since 1948 AIB (American Institute of Bakers) has set the standards for safety audits. These audit programs are widely known and highly respected in the food industries. In order to obtain AIB Certification, a facility must pass stringent safety guidelines and meet exceptionally high sanitation standards. As a vendor to the food, beverage and packaging industry, Champion offers pre AIB cleaning programs that comply to the certification program requirements. Cleaning also performed for customer audits, third party audits and laboratory evaluation.